Sonja Lowe is a natural coach and leader with contagious enthusiasm, a vast knowledge in the Direct Sales Industry and a passion to help others succeed and achieve their goals and dreams. As a proven leader, Sonja has diligently changed lives for over 11 years in what she loves to call, “the relationship marketing industry”. Despite her reputation of being a top distributor and trainer for a prominent relationship marketing company, she remains a passionate advocate for those who are just starting out in the industry. Sonja joined the Trivesta team in 2016 and ensures that every Independent Health & Wealth Advocate will have the tools and training they need to excel when they follow the Trivesta Success System. With her visionary leadership, focus on training and personal development; Sonja inspires the Health and Wealth Advocates to be the change they desire to see. As an advocate for empowering women, Sonja is a licensed minister, author and inspirational speaker. 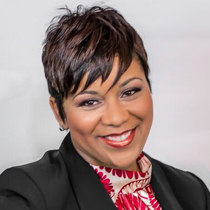 She also serves as the Founder and CEO for a non-profit 501-c (3) corporation, 1Embrace, Inc., where programs are designed to help people discover their identity and purpose. My favorite Trivesta Core Value is: Servant Leadership. I believe true leadership is servanthood. Putting the interest of others at the center of your decisions. The best leaders are givers, not takers. As a member of the Trivesta team I’m most proud of: The positive team spirit and camaraderie. We are not perfect but we are a family. I’m most passionate about: Embracing life! I am blessed and enjoy living life to the fullest with my wonderful husband, Bradford Lowe, Sr., 3 champion children, Bradford Jr, Konnie, Beyonce’ and an adorable grandson, Jordan. I value my relationship with friends and a work environment surrounded by great people. Life is a vapor, so enjoy the journey.